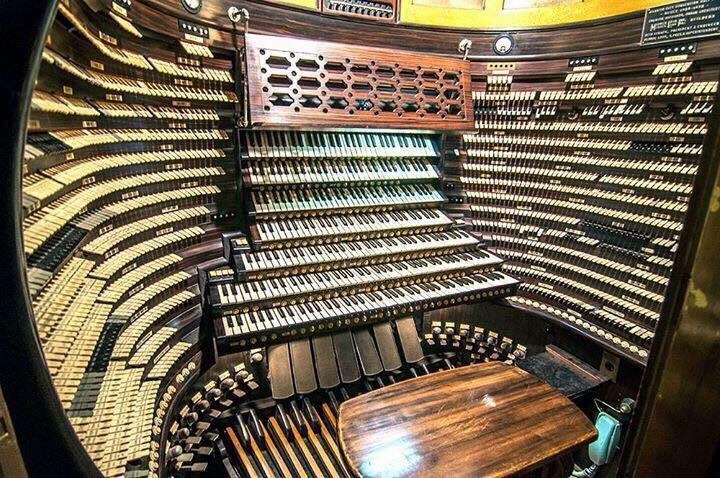 The organ is often called the King of Instruments, and in America everything has to be bigger! So the largest organ ever built is in America at the Boardwalk Hall Auditorium Organ in Atlantic City, New Jersey. The organ has four entries in the Guinness World Records including “Largest pipe organ ever constructed”, “Largest musical instrument ever constructed” and “Loudest musical instrument ever constructed”. It is one of only two organs in the world to have a 64-foot rank (ie a set of pipes with the longest being 64ft or 20m long), and the only organ to have stops voiced on 100 inches of wind pressure (about 3.6 psi) needed due to the shear size of the hall. Its console features seven manuals (keyboards) and 1,235 stops. Compare this to the organ at Lullingstone which has a short keyboard and only 5 stops! Although the instrument has not been fully functional since the 1944 Great Atlantic Hurricane, it is currently under restoration and was played in September 2013 at its first public performance in 40 years. About half the organ has been restored, but it is expected to take a futher 10 years to complete the restoration. The photo below shows the console. Google will give you further pictures of the hall and organ. Article by Alan Saunders. Thanks Alan! If you know of a an awesome instrument you could write a few words about, or even just send us a link to a video of it being played, drop me a line at drakej@live.co.uk.